MB SD Connect Compact 4 support reading out & erasing trouble code, reading the real-time data of sensor and actuator, coding and programming; wireless diagnose, support K line,CAN BUS and UDS protocol, fit all computers, with multi-language to choose. 1, I am getting an error message when I try to connect to the vehicle. It says "Initialization of diagnosis multiplexer failed...." [fault (1.1)-1.501.9551]. I have only used the machine once and now this is happening. Can you help me with this please? If you bought SD Connect compact 4, you cannot use ordinary star software for c3/c4. SD C4 software only can be used on SD C4, cannot be used on other star, like c3, c4, super star c3. Other C3, C4, SUPER C3 software cannot be used on SD C4 too. Check if you bought the wrong software. Do you install other software on the PC or HDD? Do you use anti-virus software on your PC? Another reason is your software is destroyed. 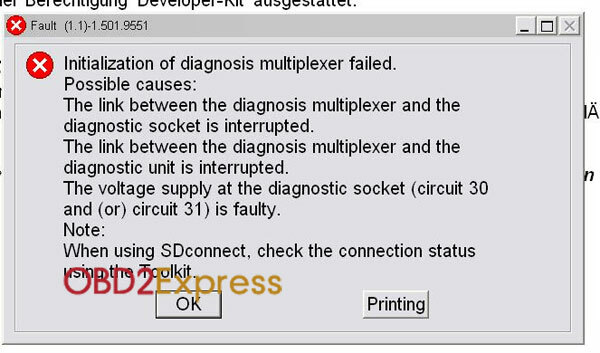 3) Firmware problem or connection problem. Check your connection, if cable is connected rightly and tightly. Cable has problem? Cable is the right one? If cable do not have problem. Check your firmware. If your software HDD is internal, then do the self test. 2. When you open the star software and meet the prompt: "Key Required. The security key for this program currently stored on your system does not appear to be valid for this version of the program. Select yes to enter a new key, or No to revert to the default setting (if any)." For this problem, it is caused by DAS not activated. Please give me your HW ID or hardware fingerprint to sales@OBDexpress.co.uk for activation. 3. I bought 2012.9 IBM T30 STAR HDD FOR star c3. I have one laptop and 3 disc hdd for ford , landrover/ jaguar, and this star HDD. I change the right hdd based on my need. 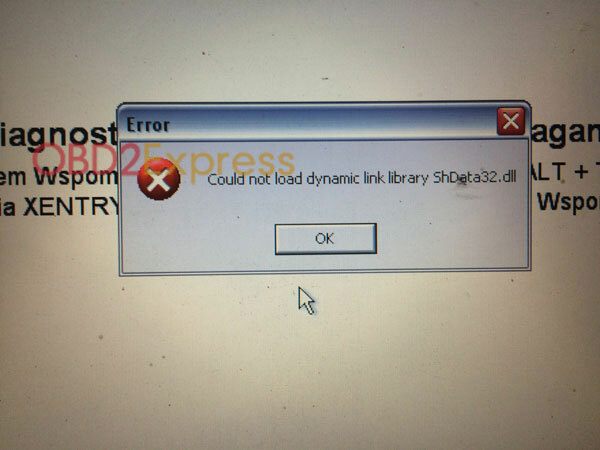 Today when i change to use STAR HDD again, it give me this prompt: "Error Could not load dynamic link library ShData32.dll" What should i do now? Please DO NOT change the star HDD frequently. It really will damage the software by doing this. 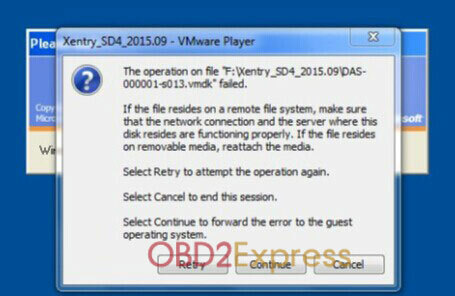 The operation on file "F/Xentry_SD4_2015.09/DAS-000001-s013.vmdk" failed. If the file resides on a remote file system, make sure that the network connection and the server where this disk resides are functioning properly. If the file resides on removable media, reattach the media. Select retry to attempt the operation again. Select cancel to end this session. Select continue to forward the error to the guest operation system. if software is broken, please send it back to us, we remake the HDD for you. 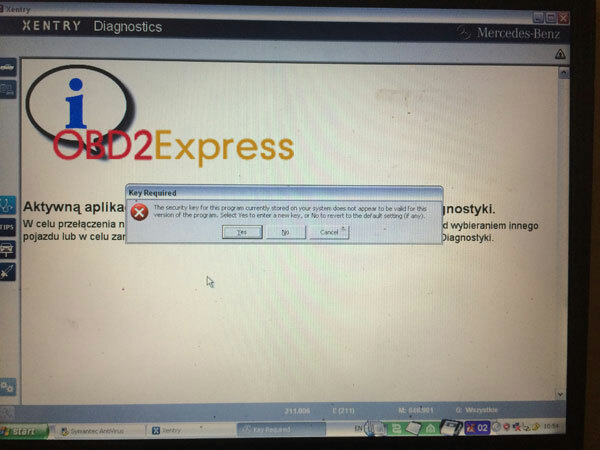 LicSaveLicense XENTRY Diagnostics. 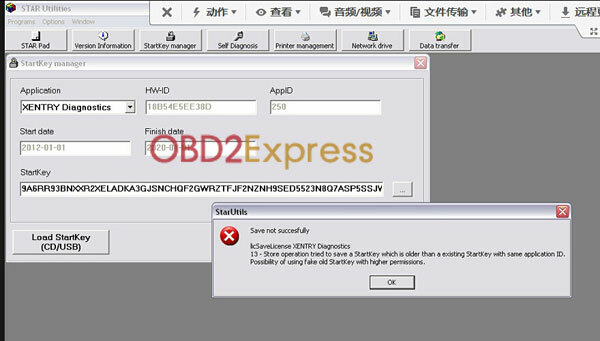 12-store operation tried to save a startkey which is older than a existing startkey with same application ID. Possiblity of using fake old startkey with higher permissions. 2) Then to back to xentry activation window. And input the activation data again, click save. Then you can save the data successfully. 6. I have question about my software due trying to open DAS an massage appear YOUR DAS HAS EXPIRED. fault 30.4. 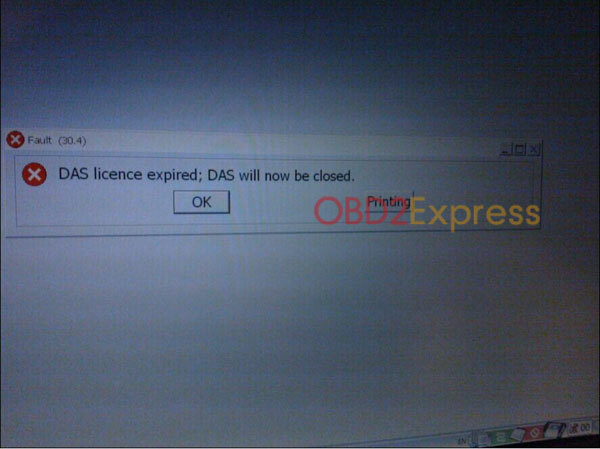 DAS license expired; DAS will now be closed. 1) Close the software, and start the software again, go to DAS to find HW-ID, give us HW-ID. 2) Then go to the attached photo, and give me DAS lan ID. 3) Send the code to use, we will give you the right activation code. Fill in the code. Then this problem will be solved.